Though protecting the child from attack, the members of the "aravt" must also complete their mission. Through their actions, they demonstrate the benevolence and bravery of Mongol warriors as the final battle closes in. There seems to have been something of a surge of interest in Genghis Khan ("Khan!") in the past couple of decades, with a 1992 starring Richard Tyson and Charlton Heston followed by the Mongolian language Genghis Khan – A Proud Son Of Heaven (1998), the Japanese/Mongolian Genghis Khan: To the Ends of the Earth and Sea (2007), Sergei Bodrov's 2007 Mongol starring Japanese actor Tadanobu Asano, the 2008 Mongolian No Right to Die – Chinggis Khaan and the Russian 2009 film By the Will of Genghis Khan. Genghis: The Legend of the Ten a Mongolian film co-directed by D. Jolbayar and U. Shagdarsuren (the use of initials instead of first names reviving memories of old-school Russsian film credits) is so spanking new that it doesn't even have a vote yet on IMDb. A good or bad sign, do you think? 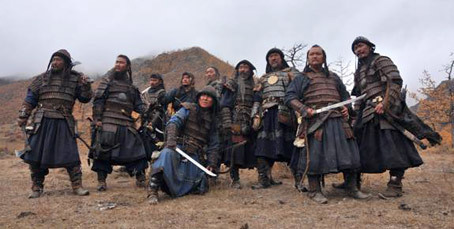 Genghis: The Legend of the Ten will be released on UK DVD on 13th August 2012 by Metrodome Distribution at the RRP of £15.99. Somewht typical for Metrodome, no extra features have been announced. We don't even have a trailer to share with you. Or a DVD cover. Hmmm.